I’m back home in Fort Lauderdale for a quick hello! Adam and I leave for Portland tomorrow, but it feels good to be home even if it’s only for a minute. I’m working on my pictures from the trip and have processed a few from our first day in Paris! Thanks to AirBNB we were able to stay in an apartment just 200 feet off of the Avenue des Champs-Élysées for a fraction of the price of a hotel in the same area. 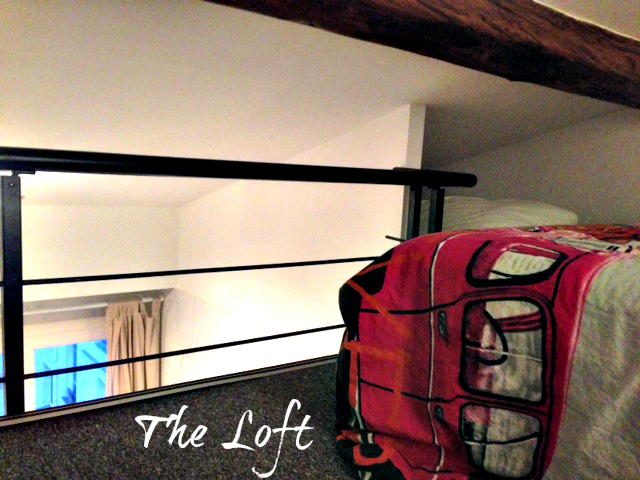 The apartment was small — think studio apartment in NYC size — but really nice! The staircase was a bit tricky to navigate as the steps are not quite even! 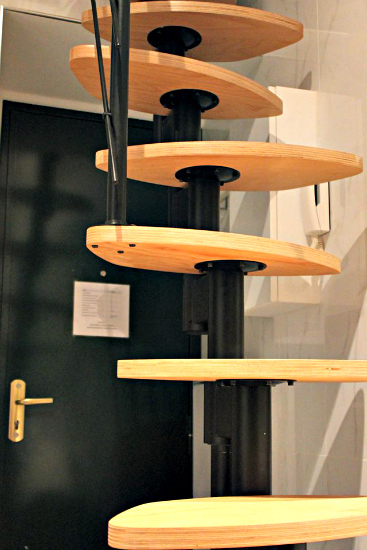 They are pretty to look at but after a couple of glasses of wine one might experience some serious difficulties getting up or down! Not that I know from personal experience or anything! I loved that the weather was perfect so that we were able to sleep with the windows open! That’s not something that we could EVER do back home. 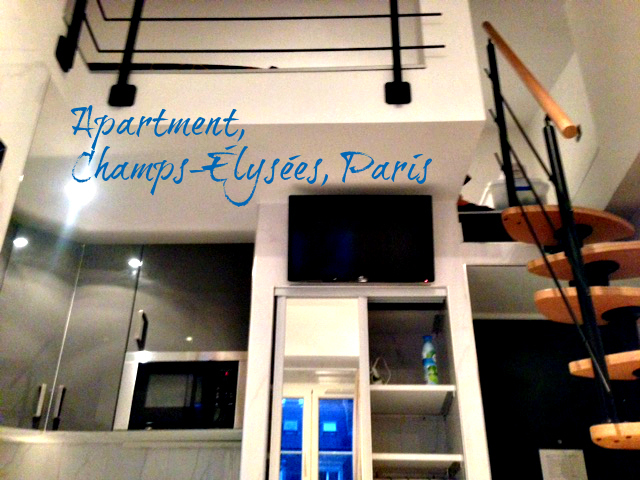 I guess because of the good location so close to the Champs-Élysées the tiny apartment rents out at over $3,500 USD per month! How crazy is that for a 1 bedroom / 1 bathroom studio style apartment?! Just a bit crazy! The avenue itself is 1.9 kilometers long (1.18 miles) and full of expensive shops and restaurants. I enjoyed staying in such a nice part of the city, but if we ever go back I would likely stay closer to The Louvre. 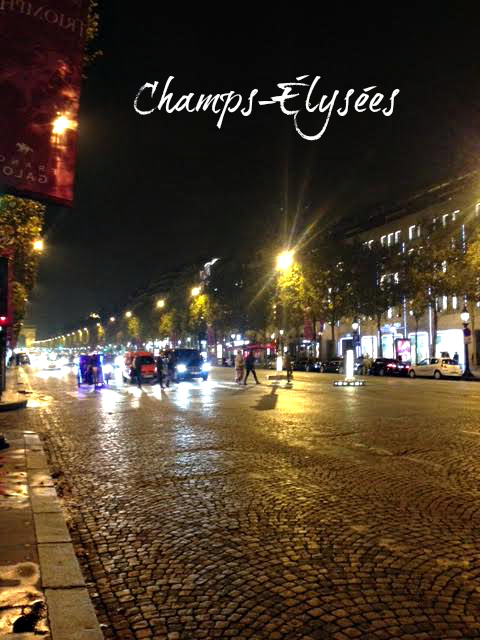 In my personal opinion, the biggest benefit of staying on the Champs-Élysées is that you’re just a stone’s throw away (or in my case, a very short run) from the Arc de Triomphe. 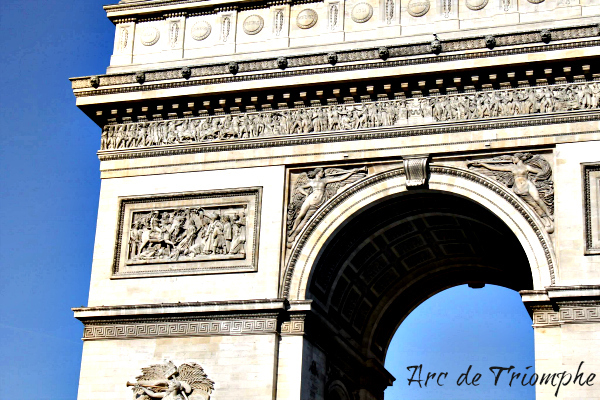 The arc was built between 1806 and 1836 in honor of those who fought for France, particularly during the Napoleonic Wars. I wish I could have gotten a better picture of the arc but unfortunately there is so much traffic near it that this was the best I could do without risking my life for a better angle. It really is a gorgeous piece of art and quite stunning in person. My picture does not do it justice! After recovering from jet lag and exploring the Champs-Élysées on Day 1, Adam and I woke up on Day 2 ready to take on some serious sight seeing in the rest of the city! You might know this little tower? But I’ll have to save all the sightseeing for another post because I’ve got to pack for Portland. In case you didn’t know, I’M RUNNING THE PORTLAND MARATHON THIS SUNDAY! Have you ever been to Paris? If so, what was your favorite thing to do/see/eat/drink? Previous Post Less Than 5 Days Until My First Marathon! Holy %^&(*! We would have gone crazy in that studio, we need tons of space. The sights are beautiful, and so cool they were only a short run away. Ahhhh Portland in 3 days!!!! So excited for you, your going to kill it! Can’t wait to read all about it!! 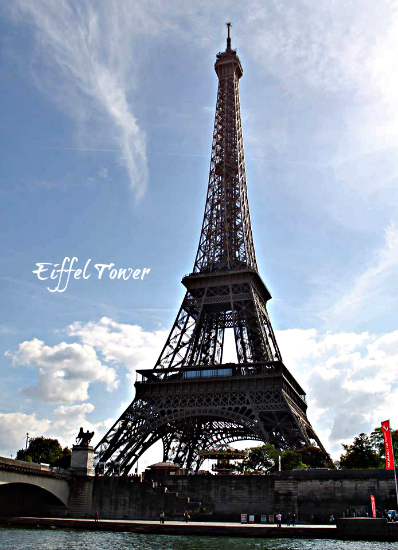 I have not been to Paris but would love to some day! And EEEEE SO EXCITED for you to run the Portland Marathon! It’s going to be awesome!!! I hope so! I really do think it will be awesome. I’m getting anxious and just can’t wait to reach the starting line now! What a cute little apartment! I love air bnb so much. And I want to see more pictures. I’ve only really been to Paris on layovers, but I love the French countryside! We got to see a lot of the French countryside on the Eurostar – it was really pretty! Much nicer than some of the areas closer to the city that are covered with graffiti. I know graffiti is considered an art form in some circles, but most of the signatures and stuff are just ugly! That’s wonderful that found such an affordable place to stay in a nice part of the city. I have never been to Pairs but would love to go. 🙂 HEY, YOU ARE RUNNING A MARATHON IN 4 DAYS! I spent HOURS looking for a nice, affordable place. 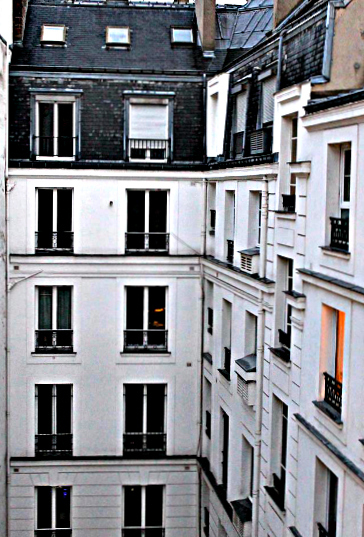 Paris must be the most expensive city for hotels … in the whole world! 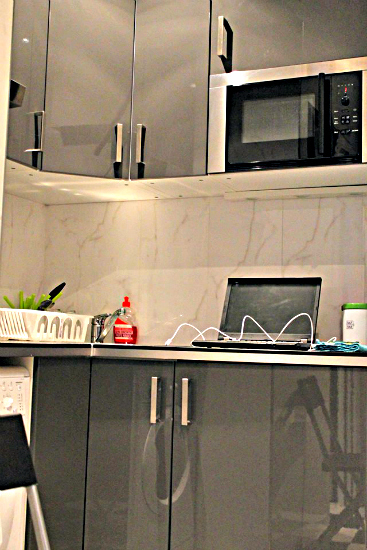 I am so excited for you–what a great apartment. Hey, you are going to be a marathoner soon! How was your quick homecoming with Cecil? Homecoming with Cecil was good!!! It’s nice to be reunited with the little guy, but our first night home after a long trip is always a bit of a nightmare because he doesn’t let us sleep. He just meows ALL. Night. Long. Ah Paris is so beautiful, definitely one of my favourite European cities! Excited for you to run the marathon! You’ll do amazingly! I loved Aix-en-Provence, but we never made it to Paris! It looks gorgeous!! Beautiful pictures!! The studio is pretty cute, I”ve never used AirBnB before (I know they are one this years sponsors for NYCM – but I’ll stay at a Hampton Inn). 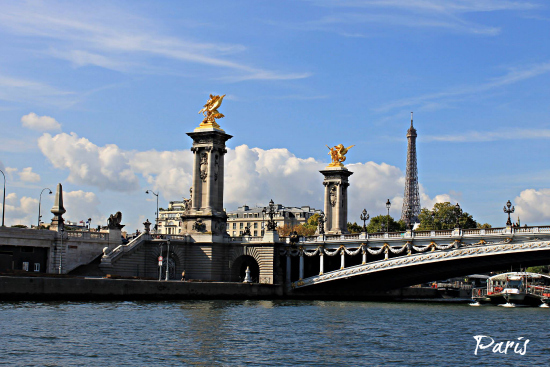 Paris is high high high on my travel list – could you imagine running the Paris Marathon or Half?